Thursday 29th June to Sunday 2nd July. Music in the Gardens is pleased to announce its line-up for this year’s 4-day music festival in the Sheffield Botanical Gardens. Each evening there will also be local support bands. 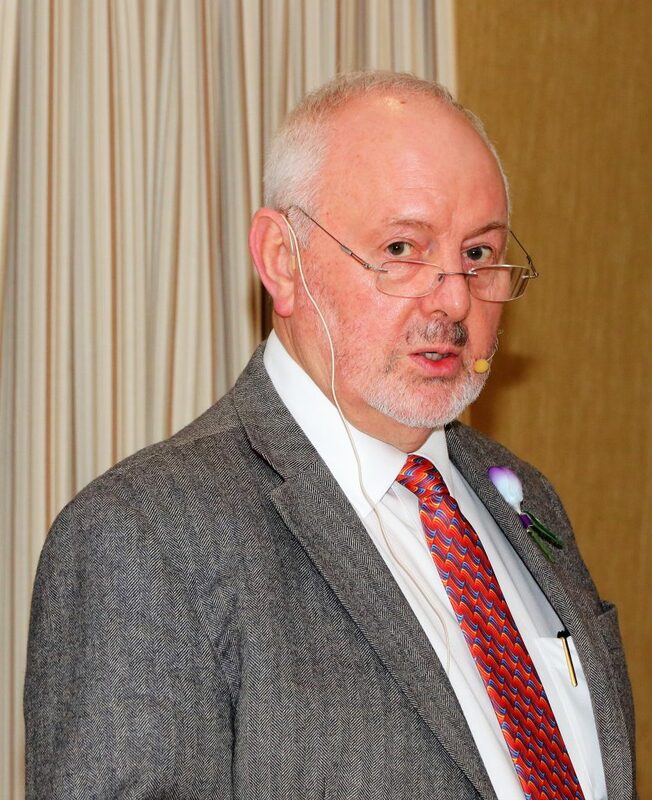 Peter Moralee welcomed over 100 fellow Rotarians to the annual Foundation Seminar at the Derbyshire Hotel on the 10th Nov. The Seminar updates club representatives on the progress of the only Rotary International charity – the Rotary Foundation. Thanks were expressed to the over 80% of District Clubs who actively support their charity in addition to their many standalone club projects. Updates were given on the End Polio mission, making a grant application, and the creative process behind the Rotary club of Doncaster St Leger’s End Polio pack for primary schools. Peace fellow Yuko Maeno updated on her progress by video from Japan, – complete with her recently born baby! A personal appearance by current peace fellow Mike Niemiec on his military experience and induction into the Rotary Peace Program at the University of Bradford provided a fascinating insight into the benefits these scholarships deliver to the world. The first ever Charity Quiz Night organised by the recently-formed Rotary Satellite Club of Chesterfield has raised £630 to be shared by three local charities:- Ashgate Hospicecare, Sheffield Children’s Hospital, and Wirksworth based Rotary Aquabox, which is a leading provider of clean water and other humanitarian aid to disasters around the World. 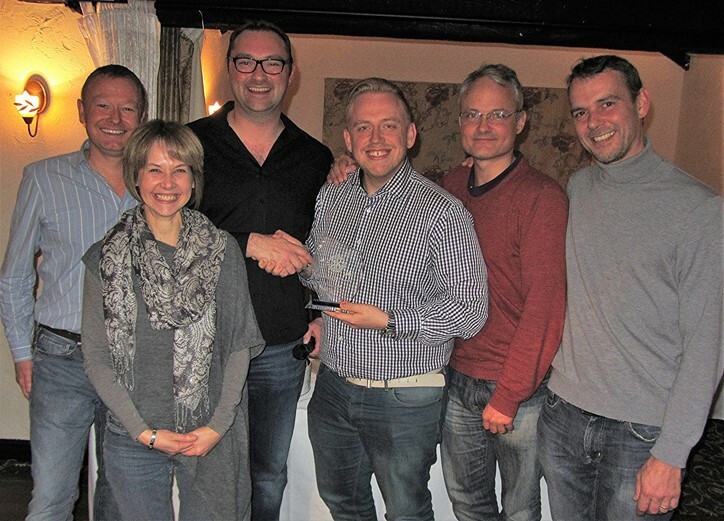 The first winners of the new Challenge Trophy was ‘The Fab Five’. The fun event, supported by around 100 people, was held at the Fox & Goose on Thursday 17 November 2016 and was organised by rotarian Paul Davies of the Satellite Club. Ashfield School can only accommodate a maximum of 9 chefs. This means we will be limiting the number of entrants. If your club intends to run a Young Chef competition, you may book a place in the District Final. Places will be allocated on first come first served basis. Please send an email to Rtn Wendy Watson (email below) before 31st December 2016 to request a place, stating the name of your club and the date of your competition. Entrants must then be notified to Wendy by the closing date. A club that books a place but does not send an entry form by the closing date will lose the place which will go to a club on the reserve list. The Rotary Young Chef Competition is a well-established and successful competition organized and promoted by Rotary International in Great Britain & Ireland and sponsored by Filippo Berio. It is a four stage national competition to support and encourage development of cookery skills. 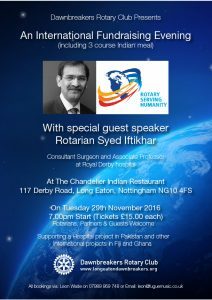 Long Eaton Dawnbreakers are holding an International Fundraising Evening at The Chandelier Indian Restaurant in Long Eaton on Tuesday 29th November starting at 7.00pm. 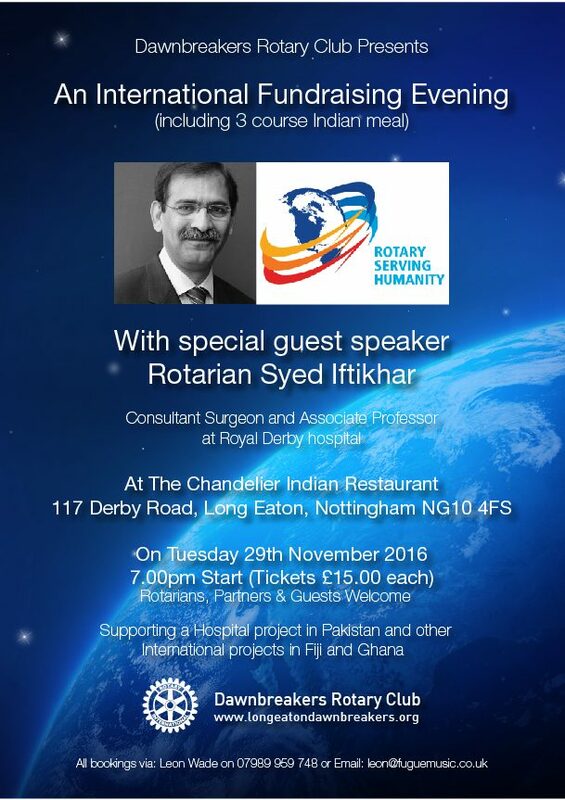 The evening will include a talk by Rotarian and Consultant Surgeon from Derby Royal Hospital, Syed Iftikhar about his work with a hospital in Pakistan. Funds from the evening will also go towards projects we support in Ghana and Fiji. Tickets are just £15 and include a 3 course Indian Meal. Booking in advance required through Rotarian Leon Wade on 07989 959748 or leon@fuguemusic.co.uk or in person at Fugue Music in Long Eaton. Three local charities have shared the proceeds from the successful Eckington Classic Car & Bike Show organised by the Rotary Club of Chesterfield at Renishaw Hall in June each year. Ashgate Hospicecare, Bluebell Wood Children’s Hospital, and Weston Park Hospital Cancer Charity have this year each received £2,900 each as a result of this popular event. 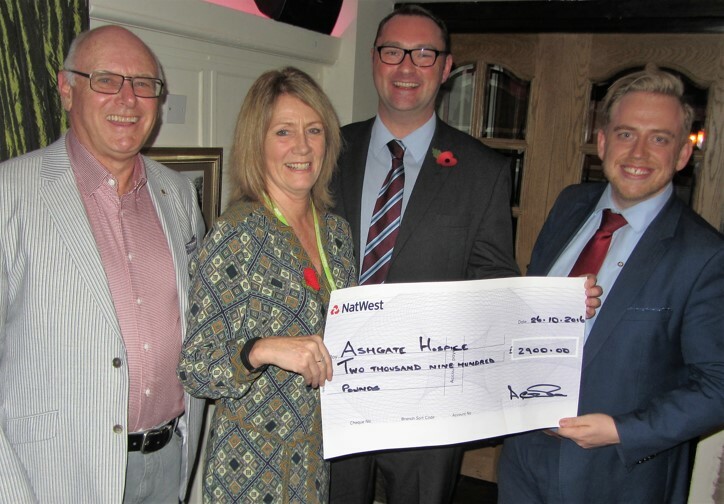 The latest presentation was made to Lynn Jones, community fundraiser for Ashgate Hospicecare, at the October meeting of the newly-formed Rotary Satellite Club of Chesterfield, whose membership of younger professionals helped steward the event. Pictured are Lynn Jones with satellite club chairman Peter Blant, satellite club secretary John Nettleship (right), and car show main organiser Alan Clarke (left). The Rotary Satellite Club of Chesterfield meets on the last Wednesday of each month at Bramption Manor, Chesterfield (5.30pm). To enquire about membership contact secretary John Nettleship on 01246 555111. The date of the 2017 Eckington Classic Car & Bike Show has already been announced, it will be held at Renishaw Hall on Wednesday 14 June 2017. 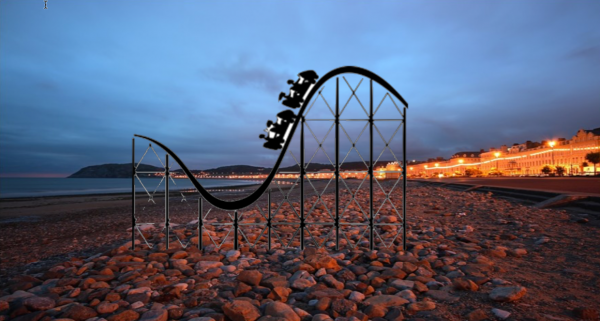 Variety of Hotels with prices to suit all pockets – remember when booking you only need B&B on the Saturday Night, for Sat Night is Gala Dinner Night. We can’t promise anything but what would YOU like to see included. Ideas to Conference Director PDG Steve Lawes via steve-lawes@ntlworld.com. An Art Exhibition has been commended for showcasing the creative work of talented local students from eight senior schools in Chesterfield. 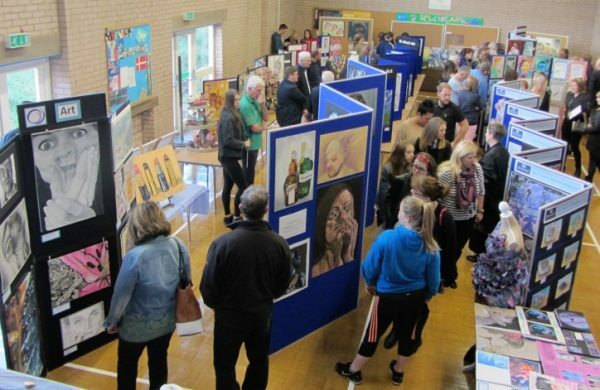 Local people flocked to see over 500 high-quality and diverse art exhibits on display at St Andrews United Reformed Church over the weekend of 8th and 9th October 2016. 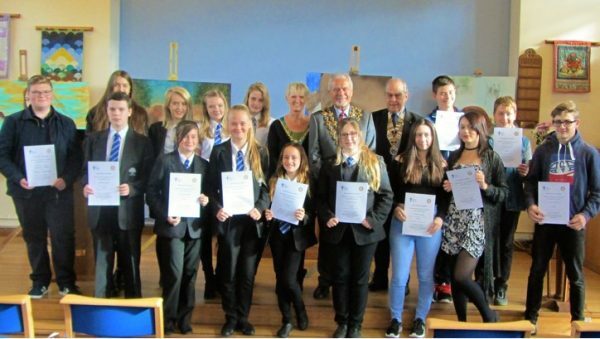 The successful event, organized jointly by the Rotary Club of Chesterfield in conjunction with local schools, was officially opened by the Mayor of Chesterfield, Cllr Steve Brunt, who congratulated the students and presented certificates. The eight senior schools taking part were:- Brookfield, Hasland Hall, Outwood Academy Newbold, Netherthorpe, Parkside, Springwell College, St Mary’s Catholic High School, and Whittington Green. 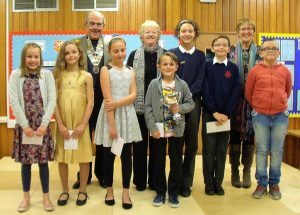 Youngsters from local primary schools in the Chesterfield area took part in the annual Junior Verse-Speaking Competition, organised for the 29th year by the Rotary Club of Chesterfield. The overall competition winner, who was presented with a trophy, was Ethan Woolley with his rendition of the poem Columbus. All the entrants received a prize for their efforts. Competition judges were Chesterfield Rotary president Mike Cudzich-Madry, Chesterfield Inner Wheel past-president Margaret Mitchell, and local school teacher Judy Stone. The event, which was held at Calow C of E Primary School on Tuesday 18 October 2016, was once again organised by Chesterfield Rotary past-president David Windle.